Discover an innovative new curriculum for smarter, naturally rejuvenating daily habits through Ayurveda and yoga. The habits you choose over time create your day-to-day thrive. What habits have you been choosing? Are they helping you—or holding you back? Evolving your habits doesn’t have to be a struggle. 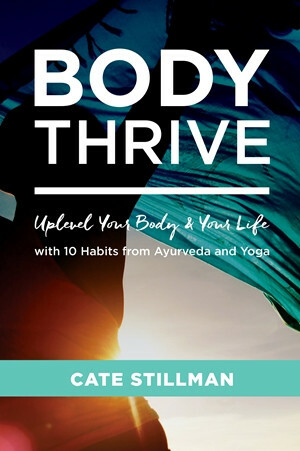 In Body Thrive, wellness expert Cate Stillman guides you into 10 critical daily routines based on Ayurveda that will rejuvenate you by aligning your daily schedule with natural biorhythms. Rather than presenting a rigid checklist of scheduled tasks, Cate encourages easy and steady progress through small actions. “You only get one body,” writes Cate. “What habits are you going to mold it with?” With Body Thrive, you’ll discover how to catalyze more energy, improve your digestion, hone your fitness routine, cultivate peace of mind, and shift your own habits toward lifelong health and wellness.